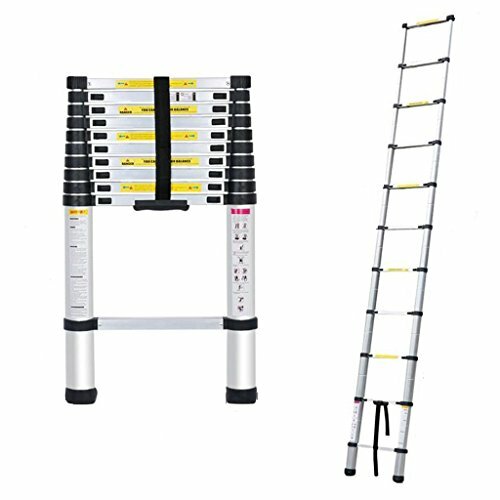 1.The folding telescopic ladder is mainly made of premium aluminum alloy. 2.Foldable telescopic style climb ladder. 3.Foldable design, convenient to use and easy to carry around. 4.Great helper for both indoor household use and outdoor activities. 5.Telescopes easily and retracts compactly for convenient use. 6.Safe and compact, black anti-slip rubber sleeve on the bottom of ladder step and multiple rubbers between two neighboring steps to avoid bumping and friction. 1.Made of rugged 6061 aluminum alloy. 2.Includes a no pinch closure system, nonslip end caps and integrated carry handle. 3.Extends and locks by the foot. 4.Lightweight, easily portable with the built-in carrying strap.